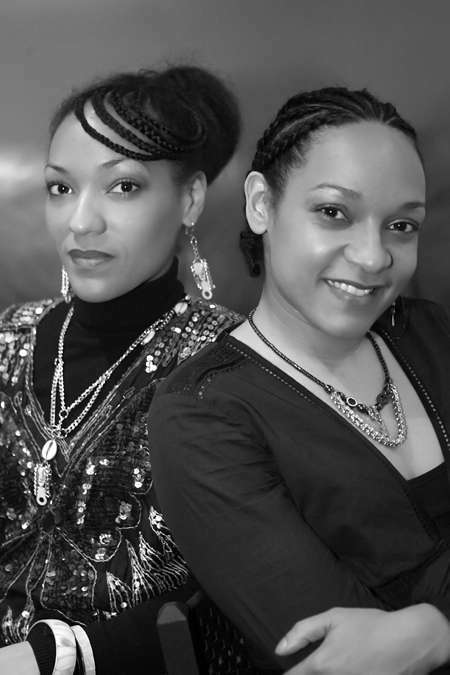 Words like these cause me to play back the conversation in which French-singing soul duo Hélène and Célia Faussart (known as Les Nubians) engaged me—perhaps more often than that of any other artist thus far. And as I listen again, something becomes increasingly apparent: an ebb and flow. There were moments when one voice would rise and the other would fall; and then moments when the two voices became almost indiscernible. It happens when sisters are so close (those naturally melodic voices and the music they’ve produced have traveled everywhere since the late 1990s). Most recently they’ve published a book/CD combination entitled Nubian Voyager: Poetry and Music from the Urban Edge. Hélène: Who said that art must be subversive? Picasso. Art must be subversive; subversive in the sense that it has to appeal people. Warm satisfaction appeared in their eyes as I brought out a copy of Nubian Voyager. Almost immediately Hélène began to flip through pages, showing me certain poems, certain urban poets she and Célia had collected over the past six years. Souleymane Diamanka, John Banzaï, Queen GodIS. A thought is provoked: even with all the new ways we have to communicate, to create—nothing is more substantial than traditional storytelling. Poetry. Spoken word. It’s the most ancient of forms. And now with our era comes a great time for it to grow. But it’s taken years for Voyager to be published. A major record company the Faussart sisters were signed with at the time had no interest—France had no need for poetry, they said. How wonderful it must be to have that sisterhood; that support. "We fought for that project like…for our lives." "And what? I’m supposed to like…stick to something? No! My identity is diverse. I am humanity. I feel like I am humanity and I am able to meet humanity on my ground, which is art. I feel eventually I’ll do an exhibition with a painter and he will paint something and I will sing and…and we will meet somewhere." A pressing desire to share something was so prevalent that it was almost pouring out of Hélène’s eyes. Of course we can hear it when she and her sister sing, but I think in an even more profound and amazing way, I saw it in Hélène’s eyes at that moment. It’s just that they have a certain want for their creations. A need to push things forward. H: I never thought that art is something easy and that art is like a manufacturing place. To me, art is more of a laboratory. And in that laboratory it’s all about trying things. You try to mix a little of this and a little of that and you see what happens. Sometimes it blows up in your face and sometimes it can create amazing stuff. Like the guy who’s gonna create the vaccination against AIDS? – He’s an artist!! H: A creator! You know what I mean? Like the fact that he tries…and let’s defy nature, you know, and let’s do something that nobody thought about. And to me art is about that. If you don’t take risks in art, maybe you’re not an artist. There’s a great diversity of contributors in Voyager. What’s so impressive is that Hélène and Célia listened to each poet read his or her work, and only then did they create music to set to each poem or work of prose. You’ll find yourself amazed at times; how a poem in the collection can be read and interpreted in a certain way, but then after listening to the music along with the spoken word? Certain things are changed. Enhanced. Amazingly different. C: We’re so proud of all of the poets. Each person has his own experience, his own life; his own way of delivering the message. We love all of them. It’s been years since we’ve been living with our poetry. H: Now we’re quoting it like it’s part of our natural language! And the thing is: spoken word has always been. Perhaps it’s just that now it has a newly created destination. Hélène and Célia—I think they realize very deeply how far they can guide it; how many thirsting ears they can reach with what they’re doing. Even ears that don’t know they are thirsting for it. H: Spoken word takes freedom of feeling and understanding. Yeah, it’s more suggestive. And this is for me the difference between hip-hop and poetry. Some people are like ‘Yeah but spoken word is now a new form of rap music.’ No. C: No. It doesn’t have the same understanding. H: Yeah, there is poetry in some hip-hop, but the inverse is not true every time. Past generations have their identity. They have their icons. But how do we define what our culture is? Who will be our generation’s memorable artists? Twenty years from now, what will people say about our artists? Who will they remember? And looking back, how will we feel about what is remembered? I know Hélène and Célia will provide us with more and more silky-smooth French soul music, but what I’m most impressed with is that they’re re-creating themselves. Constantly searching for what is new and what is now.